Century follows century featuring war, famine, revolution, and other catastrophes. The Russians just keep on trucking. How ever do they manage it? The answer may lie in their regular consumption of buckwheat. This hardy grain has been a staple of Eastern Europeans since ancient times, and Russians can lay a particular claim to buckwheat: the region surrounding Lake Baikal is the first recorded area where buckwheat was regularly cultivated. Long appreciated in Asia, buckwheat appears mostly in noodle form in that region, as opposed to Eastern Europe where buckwheat kernels, called “groats” are toasted, then boiled with water and eaten either as porridge, or as a side dish in place of rice or potatoes. From the steppes of Central Asia and the plains of Siberia, buckwheat made its way West via historical trade and invasion routes, under the name “Saracen Wheat,” in honor of the Moors of southern Spain. Buckwheat’s short growing season and ability to thrive in poor soil made it an affordable lifeline for much of Europe’s poor agrarian population. It was the Dutch who christened the hardy grain in honor of the Holy Scripture, which they believed had survived similar adversary throughout the centuries. They called the equally tenacious grain, “boek weit,” or “book wheat,” and were the first to bring it to the New World where it enjoyed widespread popularity 19th Century, but is largely ignored today. This is a shame since buckwheat packs a powerful nutritional punch: “It delivers more protein than rice, wheat, millet, or corn…but contains no potentially problematic gluten,” writes best-selling dietitian and author, Dr. Nicholas Perricone, MD, who puts buckwheat at the top of his list of grains and pulses for his patients. Buckwheat is a versatile constant in Russian cuisine. I first encountered it in St. Petersburg in the late 1980s, when food supplies were sketchy and unreliable. My friend Asiya and her mother had buckwheat or “grechka” as the Russians call it, with almost every meal. During my frequent visits to their hospitable apartment, I came to enjoy and appreciate the grain, not only for its nutty flavor, but also for the amount of energy it imparted. One serving of grechka set one up for a long day. Is it any wonder that Russia’s miracle food makes and appearance at almost every meal? Buckwheat porridge for breakfast is followed by buckwheat as a side dish to meat, pairing particularly well with both game and offal. 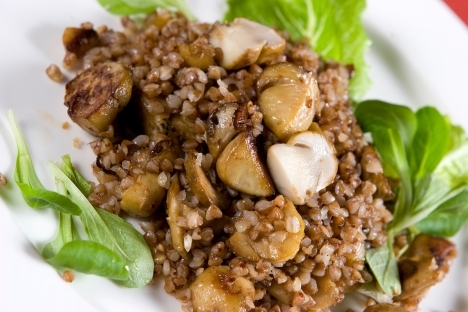 The real match made in heaven, however, is buckwheat and that other great Russian staple: mushrooms! Buckwheat and mushroom casserole is a perennial Russian favorite, being to a Russian émigré what little cookies are to Proust: the taste of times gone by. This classic Russian dish does well as a hearty garnish, stuffing, or on its own as a vegetarian main course. So, give it a try. Who knows…it might just advert your next catastrophe! - 2 cups (500 ml) of good chicken or vegetable stock. - 2 oz (60 grams) of dried mushrooms (try a mix of chanterelle, morel, and shitake), cleaned and cubed. 1.Place the dried mushrooms in a non-reactive bowl and cover them with the Madeira or boiling water. Make sure the mushrooms are completely submerged in the liquid. Set aside to soak for at least 50 minutes. 2. Heat a Dutch oven over medium high heat, and toast the buckwheat groats, using a wooden spoon or spatula to make sure the grains receive even access to the heat. Toast for 3-4 minutes, then add the egg, lightly beaten to the groats and stir to coat for 1-2 more minutes. Add the stock, reduce heat to medium, cover, and simmer for 15 -20 minutes. When just a bit of the liquid remains, remove the pan from the heat and set aside covered to finish cooking. You should wrap it up in a blanket and cover it with a pillow as Russian grannies do, but a free burner on the stove will do in a pinch! 3. Melt one pat (2 Tbl) of the butter in a heavy-bottomed skillet. When bubbling, add the mushrooms. Sauté for 7 minutes, until the mushrooms begin to release their liquid, and then re-absorb it. Set aside. 4. Use a slotted spoon to remove the re-hydrated mushrooms from the Madeira and place them into the bowl or skillet with the sautéed fresh mushrooms. Carefully strain the remaining liquid through a clean cloth and set aside. 5. Melt the remaining pat of butter (2 Tbl) in a Dutch oven. Add the garlic and onions and sauté until they turn translucent. Add the buckwheat groats and stir to combine for 3 minutes. Add the mushrooms and nutmeg and toss to combine. Taste and adjust seasoning with salt and pepper. 6.Pour the sour cream, heavy cream, and half of the mushroom liquid into the buckwheat and mushrooms. Stir to combine. 7. Reduce heat to medium low, and bring the mixture to a gentle simmer, stirring often to prevent the mixture from sticking to the bottom of the pot. The consistency should be that of porridge. When the liquid is halfway absorbed, cover and cook on low heat for 10-15 minutes until the liquid is completely absorbed. If you need more liquid, add the remaining mushroom liquid in small amounts until you achieve the desired consistency – moist, not liquid, like poultry stuffing. 8. Garnish with parsley to finish.